Abstract. 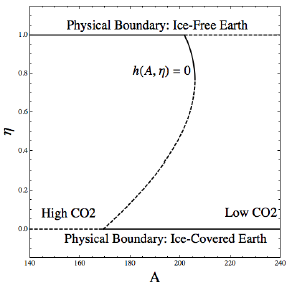 In latitude-dependent energy balance models, ice-free and ice-covered conditions form physical boundaries of the system. With carbon dioxide treated as a bifurcation parameter, the resulting bifurcation diagram is nonsmooth with curves of equilibria and boundaries forming corners at points of intersection. Over long time scales, atmospheric carbon dioxide varies dynamically and the nonsmooth diagram becomes a set of quasi-equilibria. However, when introducing carbon dynamics, care must be taken with the physical boundaries and appropriate boundary motion specified. In this article, we extend an energy balance model to include slowly varying carbon dioxide and develop nonsmooth frameworks based on physically relevant boundary dynamics. Within these frameworks, we prove existence and uniqueness of solutions, as well as invariance of the region of phase space bounded by ice-free and ice-covered states.